A semi-transparent coat can modulate the color of a base layer. By controlling the thickness of the glaze coating, specific colors can be achieved. This method bypasses traditional printing processes, using instead additive or subtractive manufacturing with materials like plastic, or metal as the base and glass, resin, or water as the coating. In addition, images can be applied to three dimensional surfaces. Attenuation of light through a transparent material exponentially decays, following a curve specific to that material. To accurately reproduce the source image, gray scale values must be correctly translated into a depth. The calculated depths needed to achieve the desired intensity values describe a surface that is the interface between the base and the coating. VeroWhite over TangoBlack. The curved shape to the coating layer is needed to obtain a linear gradient. Liquid can be used as the glaze coating, dramatically transforming a static relief into a grayscale image. 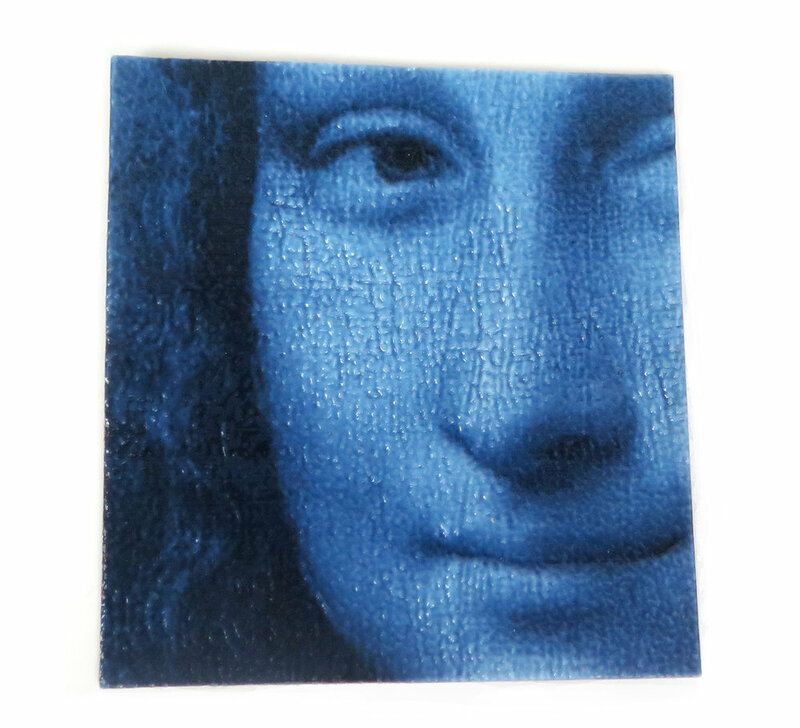 With a two material Objet printer, monochromatic images can either be created by printing a coating of VeroWhite over either VeroBlack or TangoBlack, or vice versa. VeroWhite over black creates a bluish tint. A black material on top makes a warmer toned image. The base and coating meshes are printed using the standard software. Gradient resolution is limited by voxel size. Because attenuation is nonlinear, the step between no coating and a one voxel coating is much more pronounced than the step between coatings 30 and 31 voxels thick. With a black material on top, steps between lighter shades are distinct (notice the sky in the ocean image). Textures can be applied to three dimensional shapes in a similar manner. The interface between the coating and the base surface is found by displacing the surface of the source model by z values calculated from the texture map. The full color spectrum can be reproduced using layers of cyan, magenta, and yellow. Because each layer is full transparent to the others, the layer order doesn't matter and the image can be viewed from either side. Backing the CMY layers with white will create an opaque image, with stronger colors. The pieces shown are made in layers of resin dyed. Each layer was poured, allowed to cure, and then machined away to the required thickness.